Pamper yourself with the touch of traditional Balinese beauty treatment and feel your body refreshed by our friendly and professional staff. You may want to try the Javanese lulur body scrub, Milk bath and scrub, or Facial treatment combining traditional and modern techniques and treatment. Other hair treatment, manicure, and pedicure are also available here at the salon, all done in a shooting atmosphere of our Salon & Spa. A natural and exotic treatment combining foot massage, traditional Balinese massage and body scrub. The session begins with Thalassic Footbath, flower bathing your feet and cleaning those rough and callous areas, carefully using special salt and natural volcanic pumice stone, continue with foot massage to relax the tensions accumulated around the feet. A traditional Balinese massage with your choice of aromatic oils. Brings warming and smoothing sensation also it helps to lift anxiety and depression and balance the mind and body with peaceful feeling. Traditional body feelings by using shredded coconut mixed with local herb to stimulate and exfoliate the skin. This scrubs is essentially for burned skin after a long sunbathing. The treatment is ended with flower bath and aromatherapy. This popular Indonesian head, neck and shoulder massage, improve blood circulation and revitalize your hair and scalp, leaving them healthy and fresh. A special steamer allows the cream to penetrate your hair’s fibred prior to a wash and blow dry. The treatment includes shaping of nails, cuticle removal and application of nail polish colors. 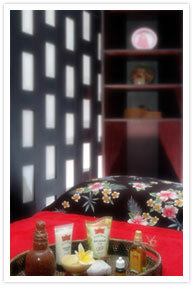 The treatment, which has been practiced centuries ago using traditional body scrub from Kingdom of Central Java. To Begin the treatment is with a traditional massage using aromatherapy oil to relax body tension and blood circulation then applying combination powder of turmeric, sandalwood, sweet woods and spice roots scrub that will soften and smooth your skin and keep your skin fresh, and fragrantly stench. Body treatment firstly introduce by Cleopatra, Queen of Egypt. Treatment starting with traditional massage using aromatherapy oil, applying milk body scrubs to clean and whiten the body removes blemishes and makes the skin suppler. Flower and milk bath and shower will follow the treatment. A total face treatment to refresh your skin and removes dead cells eliminate wrinkles and rejuvenates mature skin, giving nutrition to face based on skin type. Combination of traditional and modern technique using choice of traditional ingredient or modern ingredient such as, Lancôme, Ultima, Clarins, Biokos, etc.